STYLISHLY DESIGNED – Available in 6 premium styles: Classy Café, Stylish Horizontal Stripes, Elegant Leaf Curve, Bronzed Fleurs, Dashing Diagonal, and Sophisticated Square. 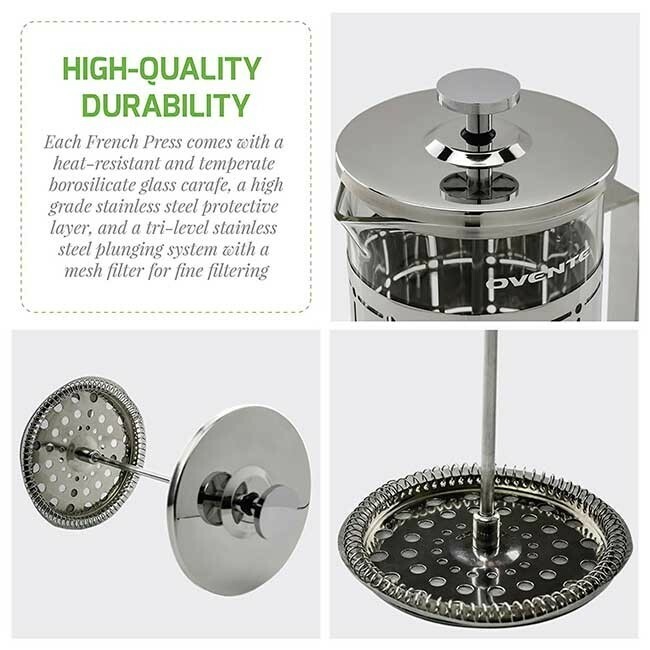 Their unique stainless steel designs flatter any kitchen countertop or desk. 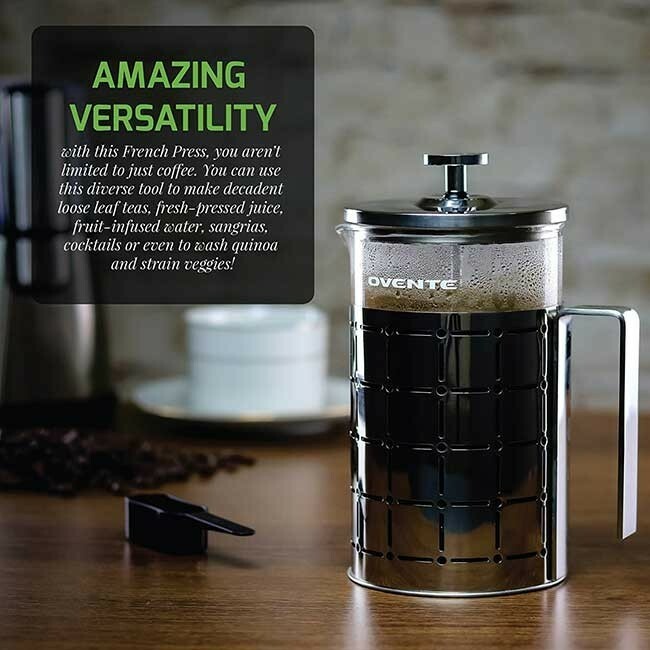 HIGH-QUALITY DURABILITY – Each French Press comes with a heat-resistant and temperate borosilicate glass carafe, a high-grade stainless steel protective layer, and a tri-level stainless steel plunging system with a mesh filter for fine filtering. 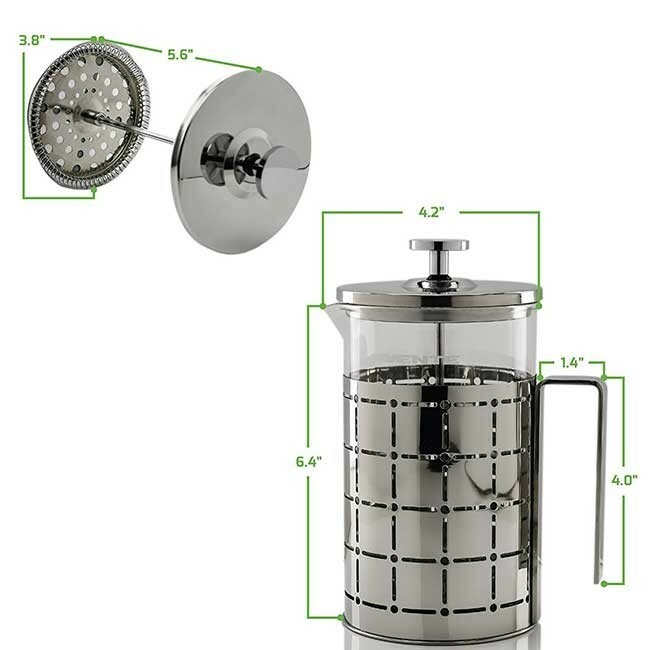 INCREDIBLE VALUE & PRACTICAL – Gives you superior quality for less, and all parts are dishwasher safe. 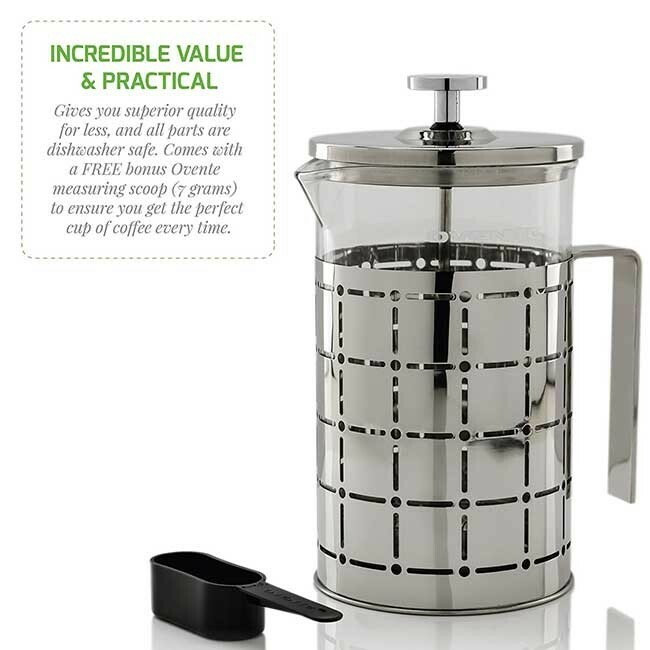 Comes with a FREE bonus Ovente measuring scoop (7 grams) to ensure you get the perfect cup of coffee. every time. 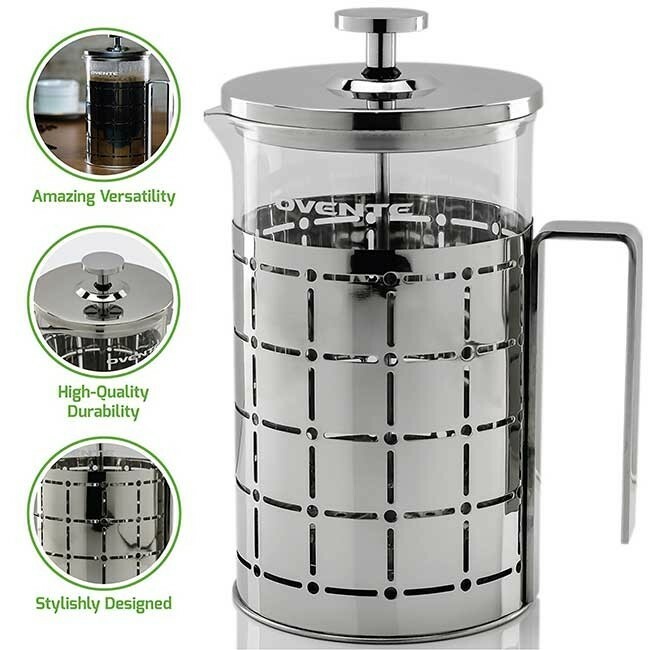 Just like how the most scrumptious foods contain some oils and fats, the Ovente Stainless Steel French Press works thoroughly to extract all the flavorful oils and bold, complex flavors that naturally occur in gourmet coffee beans. These flavor-enhancing oils are absorbed by the costly paper filters used with traditional coffee pots. The 3-part stainless steel plunging system uses a fine mesh filter to thoroughly extract all the succulent flavors from your coffee grounds, leaving you with a smooth cup of coffee with little to no waste. 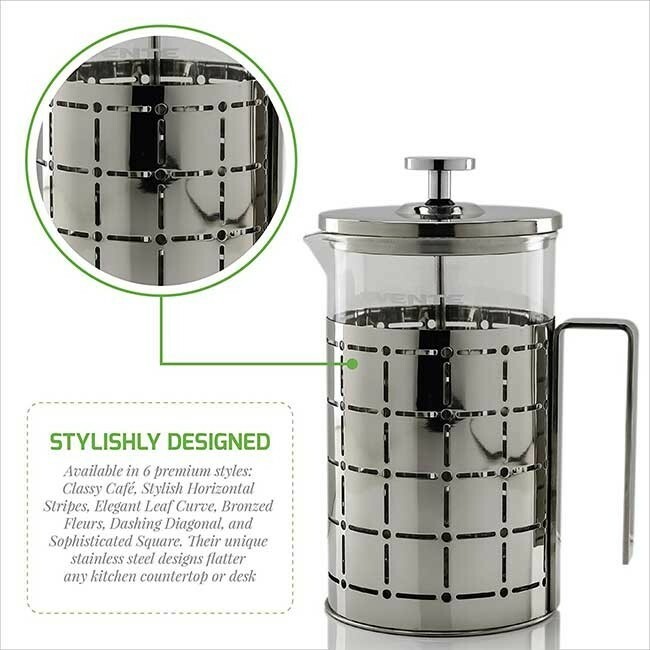 Composed of heavy-duty, heat-resistant borosilicate glass, the durable carafe is equipped with a beautifully designed protective stainless steel shell, making it perfect for taking it with you to work or on vacation. 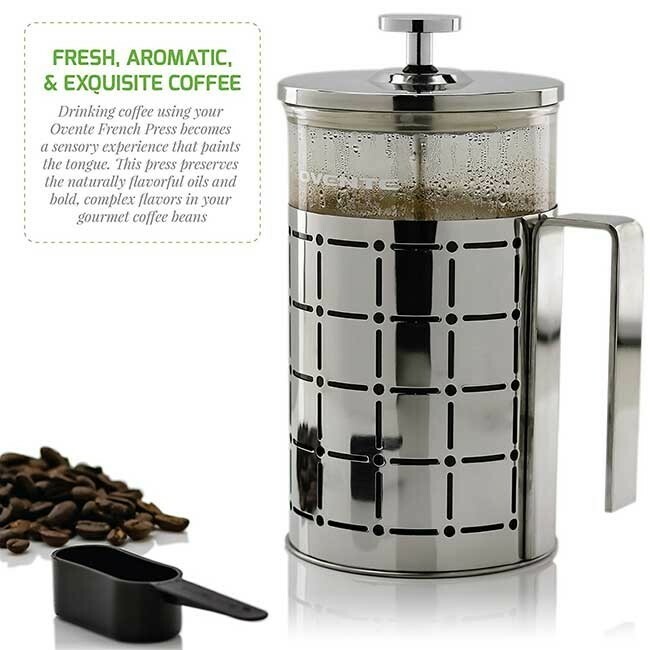 You’re also not limited to just coffee or tea, this handy tool can be used to make espresso, yerba mate, lemonade, real hot chocolate, apple cider and almond milk too. And its versatility goes beyond just drinks—you can use it to wash grains, make chicken stock, strain frozen vegetables, create a unique terrarium, and infuse essential oils!